Matt Paterson came off the bench to head home an unlikely 90th minute winner for the Shots at the Rec tonight. They had earlier been reduced to ten men when stand in left back Jordan Roberts was dismissed for two yellow cards. 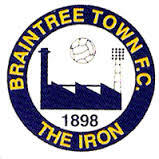 In truth Braintree will count themselves unfortunate to leave with nothing, as they had the lion’s share of possession and chances in the second period. Andy Scott had to make two enforced changes from Saturday’s victorious starting line-up. In came Millwall loanee Aiden O’Brien for outgoing loanee Charlie Strutton, who unfortunately sustained a fractured fibula in the Southport game. Jaydon Gibbs replaced the injured Chris Barker and he went on to have a very good game at right back. The Shots were attacking the High Street end and in the 6th minute threatened from a quick counter attack. Adam Mekki went on a surging run and found Williams, but his shot was well blocked by a defender. The visitors took the lead in the 16th minute however. Adam Webster lost an initial tackle and, in trying to win back the ball, he brought Mulley down inside the area. Kenny Davis stepped up and calmly slotted home. In the 20th minute Butler whipped in an excellent free kick across goal and Hamann had to be on his mettle to push it behind for a corner. The resulting flag kick was only half cleared and when the ball came to Brett Williams he swivelled and volleyed into the bottom corner. It was an excellent finish from the Shots leading goal scorer. Braintree were looking dangerous in attack, with Mulley especially lively. Mekki and Roberts then linked up well down the Shots left and the latter’s cross just evaded Young at the far post. In the 31st minute Roberts was booked for hauling down Peters and this was to have ramifications for the Shots later in the game. Two minutes later Holman fired over as Butler backed off him. Then a pinpoint ball out of defence from Gibbs found O’Brien, who laid it off for Young, but his effort was easily saved by Hamann. The Shots were quickly out of the traps in the second half. O’Brien did well to block a defenders clearance, but he then fired his subsequent effort wide of the target. Young then outran his full back and centred, but O’Brien just failed to make contact at the far post. The visitors then had the ball in the net, but it was disallowed for a foul on the keeper. In the 53rd minute Isaac’s shot was well saved by Henly at full stretch. At the other end, after a neat move down the Shots left, Roberts’ excellent delivery into the danger area was met by Williams, but he couldn’t direct his effort on target. On 72 minutes Isaac slid the ball through to Holman from a free kick, but the forward wildly blazed over, when he really should have done better. Braintree were piling on the pressure on the Shots defence now, winning numerous corners, but special credit must be given especially to the Shots makeshift central defensive partnership, who dealt with everything thrown at them. In the 77th minute things looked bleak for the home side when the Ref adjudged that Roberts had brought down Daley, and he issued him with a second yellow card. Matt Paterson then replaced O’Brien on 83 minutes for the Shots. Two minutes later Braintree substitute Cox’s header from a corner was well tipped onto the bar by Henly. The defining moment of the match came in the last minute. Craig Stanley did well down the Shots left and his measured cross found Mekki. The Shots winger completely scuffed his shot, but fortunately for the Shots it went straight to Paterson, who headed home from 10 yards out. Braintree then threw the kitchen sink at the Shots in the three added minutes, and only an outstanding save from Henly, in keeping out Holman’s effort, stopped them getting what they would say would have been a deserved equaliser. The win moves the Shots into 21st place and now only a point from getting out of the relegation zone. TS RATINGS: Henly 7, Gibbs 8, Roberts 7, Stanley 7, Butler 7.5, Webster 7.5, Mekki 7, Oyeleke 6.5, Williams 7, O,Brien 6.5 (Paterson ), Young 6.5.